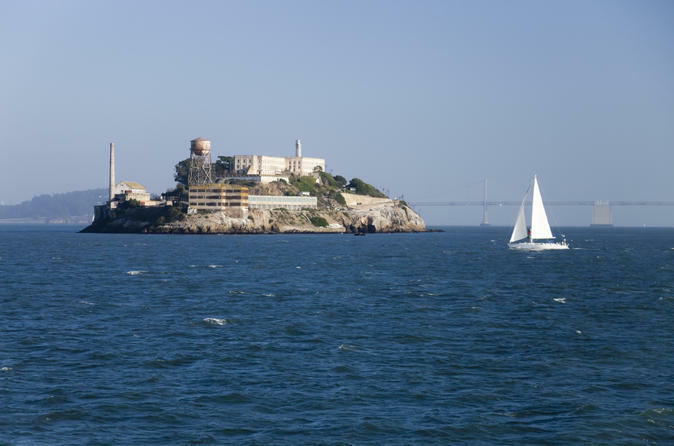 Start your day with a 15-minute ferry ride from Pier 33 to Alcatraz Island. While cruising across San Francisco Bay, take in the scenic panorama of the Bay Bridge, Golden Gate Bridge and city skyline. Stroll through the prison cell-blocks and listen to recorded commentary from former inmates and staff. You'll learn about A-list gangsters such as Al Capone (Scarface) and Machine Gun Kelly, and discover how several prisoners attempted escape. If you wish, you can also explore the historical gardens before returning to Pier 33 on the ferry (departs every 30 minutes). Back in the city, grab some lunch (own expense) at any of the numerous eateries around Pier 33 and the Embarcadero, and then make your way down to the meeting point for your afternoon bike tour starting in the heart of Chinatown! During the 3-4 hour bike tour, your knowledgeable guide shares anecdotes about San Francisco’s history and fills you in on the characteristics of each neighborhood you cycle through, including the artistic side of SoMa, and hip Mission District. Stop at three popular establishments — breweries, pubs, bars or beer halls — where you can relax and enjoy craft brews while mingling with locals. You may visit 21st Amendment, Local Brewing Co, Thirsty Bear Brewing Co, Southern Pacific Brewing Company, Zeitgeist, Toronado or Magnolia Brew Pub. Your first beer is included, and you can purchase food and more beer at the other stops. Finish your tour with a loop through Union Squares bustling activity and back to Chinatown to discuss your evening adventures.